2015 Mazda MX-5 2.0 review | What Car? After a couple of ‘taster’ drives abroad in pre-production models, we’ve finally had a chance to test the all-new Mazda MX-5 on UK roads. The new model is, at just 3.9 metres in length, the shortest it’s ever been in its 25-year history, and at 1090kg (including the driver) in base form, almost as light as it's ever been, too. Making it more compact and light should not only make it more fun to drive, but also more economical. Mazda offers two four-cylinder petrol engines: a 1.5-litre entry-level unit and the 2.0-litre range-topper we’re testing here. Our 2.0-litre car has 158bhp, and cracks 0-62mph in 7.3sec. It can also return an impressive 40.9mpg. Even the 1.5 can see off 0-62mph in 8.3sec, and return a claimed average of 47.1mpg. Both get a six-speed manual gearbox, and an automatic will arrive in due course. What's the 2015 Mazda MX-5 2.0 like to drive? The 2.0 engine is one that needs to be revved to access the power, because it doesn’t have the low-down grunt that modern turbocharged engines offer. 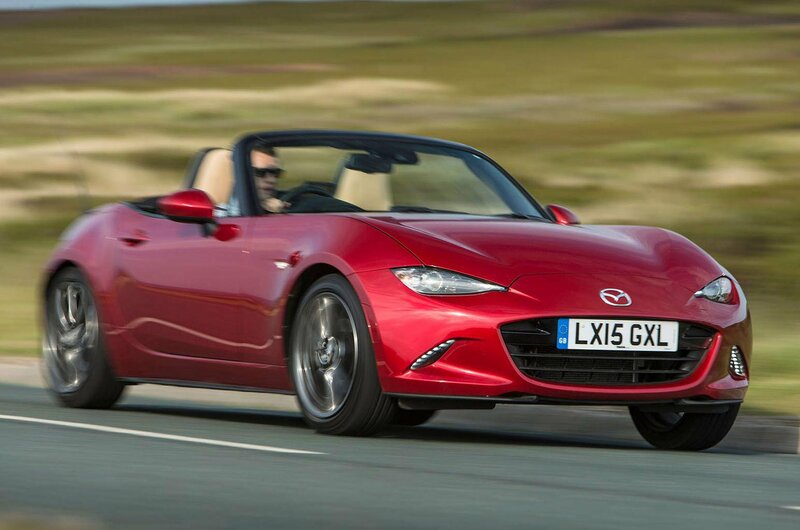 While the MX-5 may not be as fast as turbocharged rivals such as the Audi TT and BMW Z4, the driving experience is always rawer and more engaging. This is the kind of car you can have fun in without breaking the speed limit, and the performance on offer is perfect for British roads. The gearshift is also slick and precise. At town speeds the MX-5 is genuinely nippy, and overtaking is a doddle on faster A-roads. Our test car came in the range-topping Sport Nav trim that includes a sportier suspension set-up. Nevertheless, the MX-5 rides extremely well, with bumps in the road being absorbed by the car rather than passed on to the occupants to endure. The electrically assisted steering system is also sweet and precise, and makes cornering a real pleasure. The car can be accurately placed in corners, and there's plenty of feedback on offer. Refinement is good rather than great on the motorway, but put down the roof and you can still have a conversation with your passenger without shouting. What's the 2015 Mazda MX-5 2.0 like inside? This new MX-5 might be smaller than the model it replaces, but some clever design tricks and impressive visibility mean that the interior never feels claustrophobic. The cabin is also stylishly designed and made from materials that look and feel good quality. The 130-litre boot is 20 litres smaller than the previous car’s, but it is a more useable space. Meanwhile, the roof can easily be dropped or raised with just one hand. The £20,095 SE-L trim makes the most sense because it comes with a DAB radio, Bluetooth, climate control and a 7.0in touchscreen infotainment system. Navigation is a £600 option. The new MX-5 offers a fine driving experience. When you throw in its affordable pricing, those likely low running costs from Mazda’s typically impressive real-world fuel economy, and its fine looks, it certainly makes it one of the most compelling cars in its class.